With so many Bible translations available today, how can you find those that will be most useful to you? What is the difference between a translation that calls itself "literal" and one that is more "meaning-based"? And what difference does it make for you as a reader of God's Word? How to Choose a Translation for All Its Worth brings clarity and insight to the current debate over translations and translation theories. Written by two seasoned Bible translators, here is an authoritative guide through the maze of translations issues, written in language that everyday Bible readers can understand. Learn the truth about both the word-for-word and meaning-for-meaning translations approaches. Find out what goes into the whole process of translation, and what makes a translation accurate and reliable. Discover the strengths and potential weaknesses of different contemporary English Bible versions. 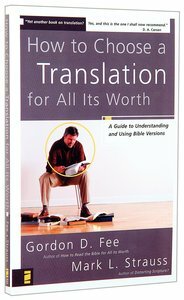 In the midst of the present confusion over translations, this authoritative book speaks with an objective, fair-minded, and reassuring voice to help pastors, everyday Bible readers, and students make wise, well-informed choices about which Bible translations they can depend on and which will best meet their needs. - Publisher Mark Strauss (PhD, Aberdeen) is professor of New Testament at Bethel Seminary in San Diego. He has written The Davidic Messiah in Luke-Acts, Distorting Scripture?, The Challenge of Bible Translation and Gender Accuracy, and Luke in the Zondervan Illustrated Bible Background Commentary series. Forthcoming books include The Gospels and Jesus, Mark in the revised Expositor's Bible Commentary series, and Mark in the Zondervan Exegetical Commentary series. About "How to Choose a Translation For All Its Worth"
Mark Strauss (PhD, Aberdeen) is professor of New Testament at Bethel Seminary in San Diego. He has written The Davidic Messiah in Luke-Acts, Distorting Scripture?, The Challenge of Bible Translation and Gender Accuracy, and Luke in the Zondervan Illustrated Bible Background Commentary series. Forthcoming books include The Gospels and Jesus, Mark in the revised Expositor's Bible Commentary series, and Mark in the Zondervan Exegetical Commentary series. Customer Reviews For "How to Choose a Translation For All Its Worth"
Fee & Strauss give a tantalising survey of the issues involved in translation, so that regular users can judge between the myriad English versions. They offer many good examples, from virtually every version in use today. Many people will enjoy the book, but it definitely errs towards the technical side of translation. The authors are strong proponents of dynamic/functional equivalence, and could have devoted a little more space to WHY it's more important to preserve the meaning of Scripture rather than the grammar of the original. Nor do they appear to engage at all with those who would argue in favour of the latter. Be wary of the title. This isn't a book for everyone. Nor is it merely a superficial guide to different versions. But for those with interest in or responsibility for choosing between versions, or any interest at all in translation, it's a well-written presentation by two professionals. They clearly love the Bible, and want to make it accessible for God's church to whom it was given.